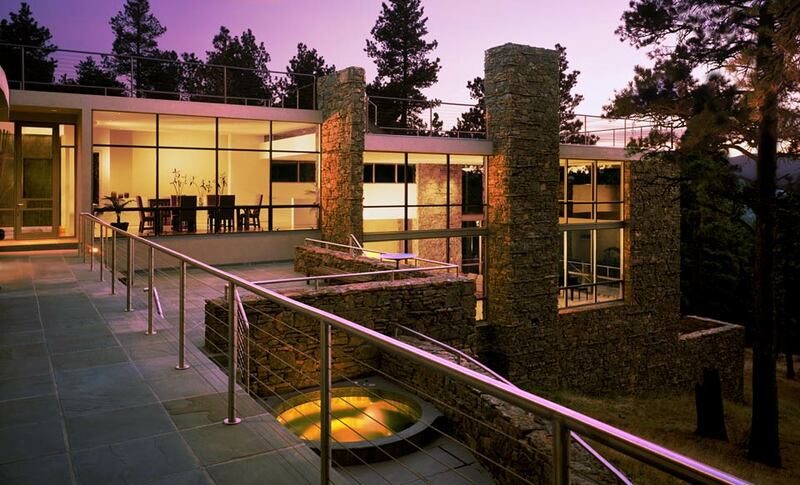 This transcendent estate has been featured in significant architectural books including “100 of The Worlds Best Houses” and “Architecture Now.” Designed by Alexander Gorlin AIA, Mr. Gorlins firm has won numerous awards including most notably AIA design awards for this home and Architectural Digest recognized Mr. Gorlin as one of the country’s top 30 deans of design. 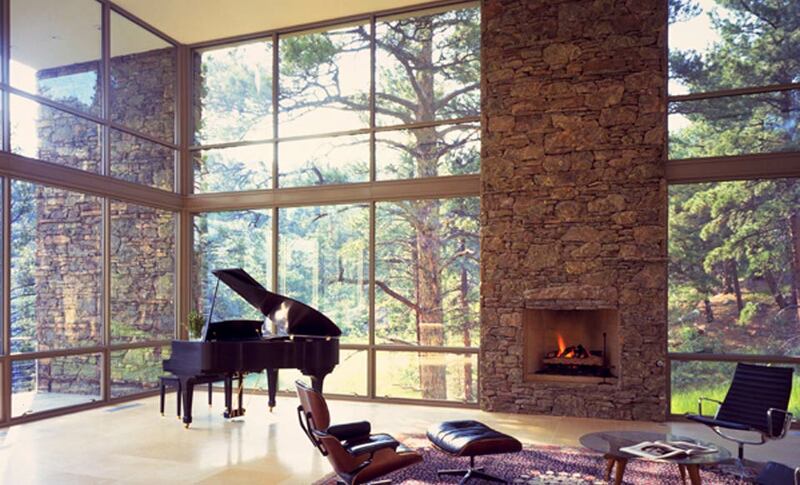 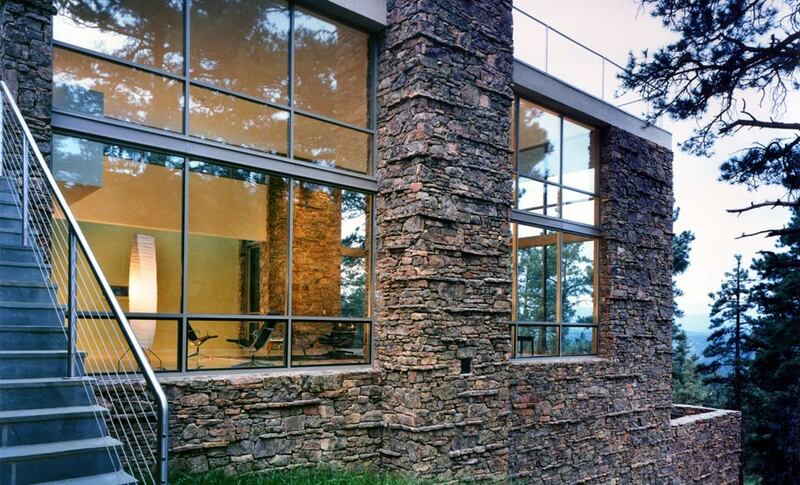 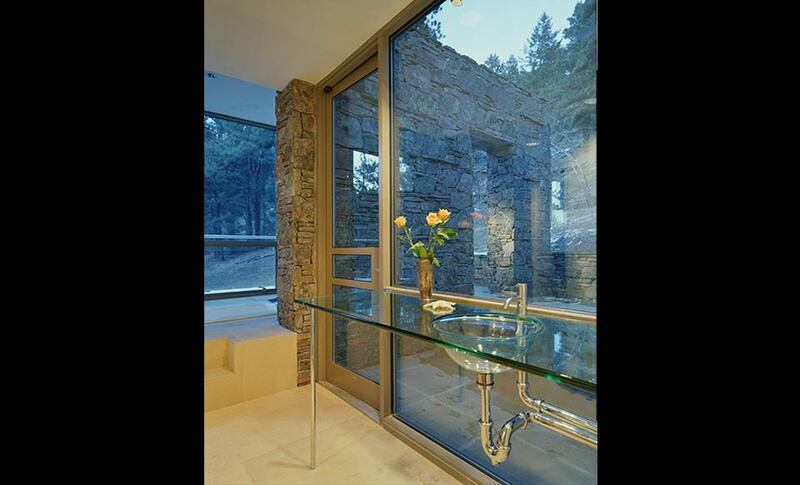 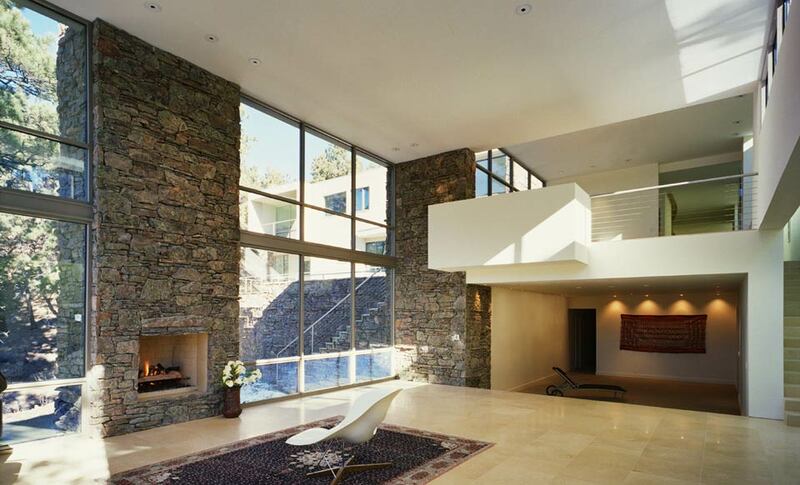 This 8000 square foot home of stone and glass is built on a two hectare mountain site between two streams and within view of 4200 meter mount evans, is constructed of concrete block with moss rock stone veneer (a local stone that changes with the humidity, becoming greener with the morning dew) and a steel frame structure. 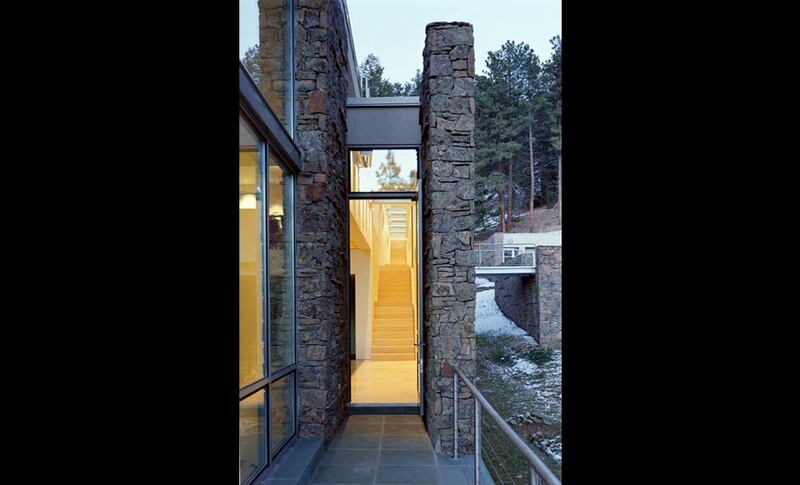 A bridge over a revine, sheltering an elk path that runs through the site, leads to the front door. 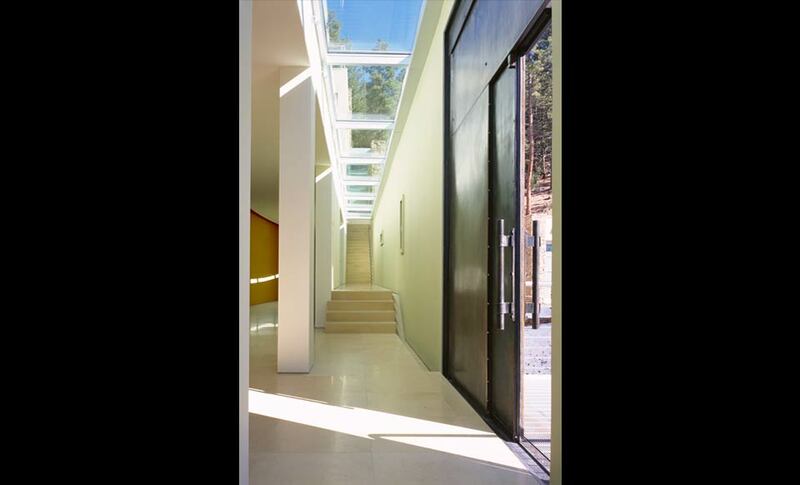 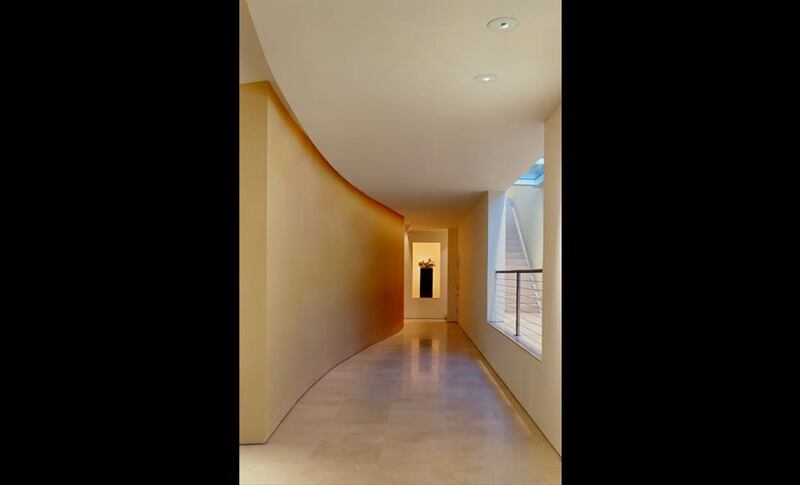 The entry is by way of sliding steel doors and opens into a curved entry hall with an endless skylight. 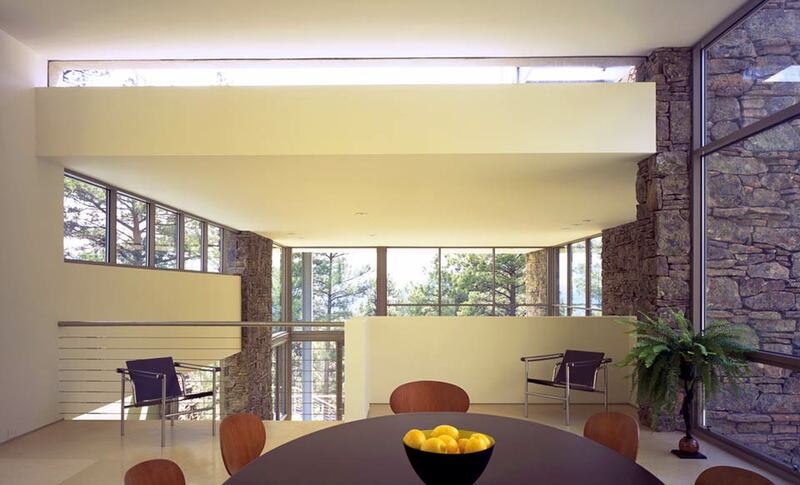 The dining room overlooks the living room below, the kitchen and family room beyond. 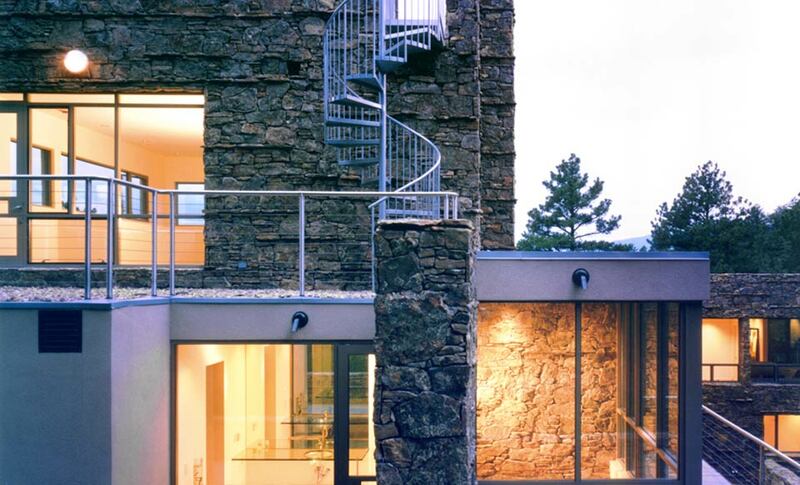 The children’s wing at one end is answered by the parents bedroom in the tower and the office at the summit. 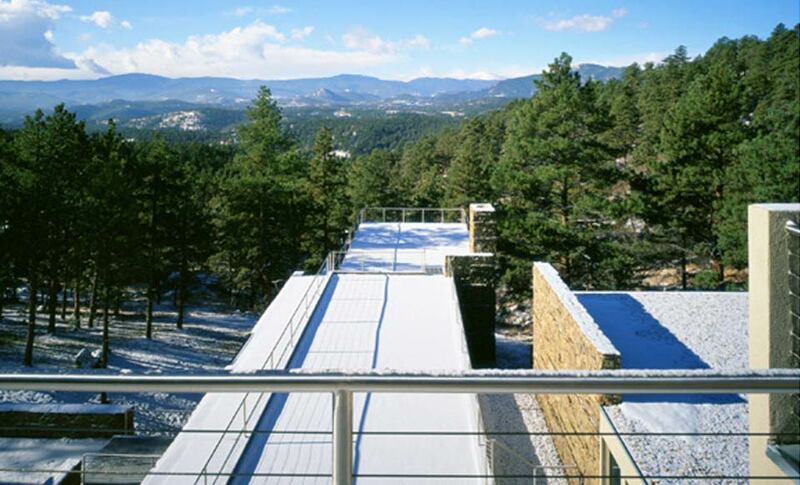 4 Fireplaces, 5 car garage situated below & sheltered from temperature fluctuations, separate nanny quarters and a guest house. 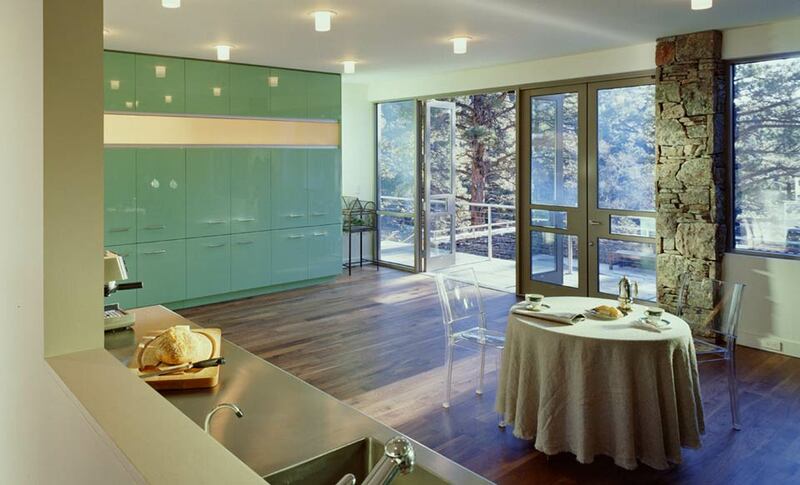 The green living home uses reclaimed walnut flooring, low-e glass, in floor radiant heat, ipe wood decking, reduces fossil fuel use with its geo thermal heating and is oriented to the mountain winds obviating the need for air conditioning. 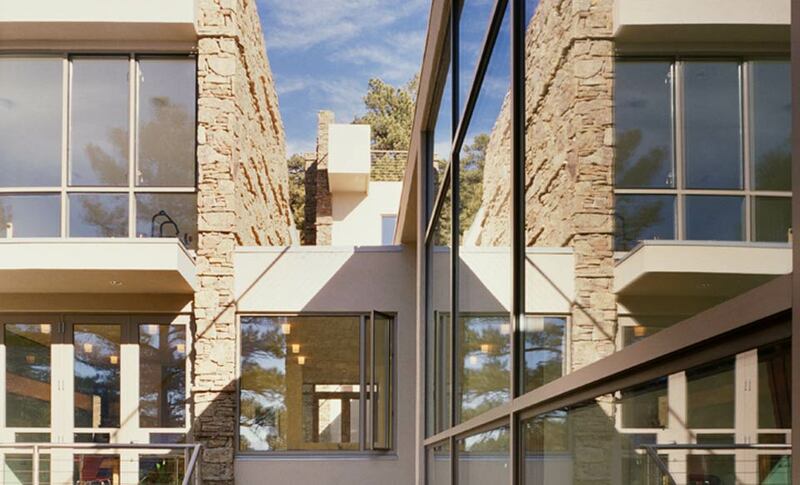 Rather than a massive central volume, the house is laid out as an abstraction of the local landscape. 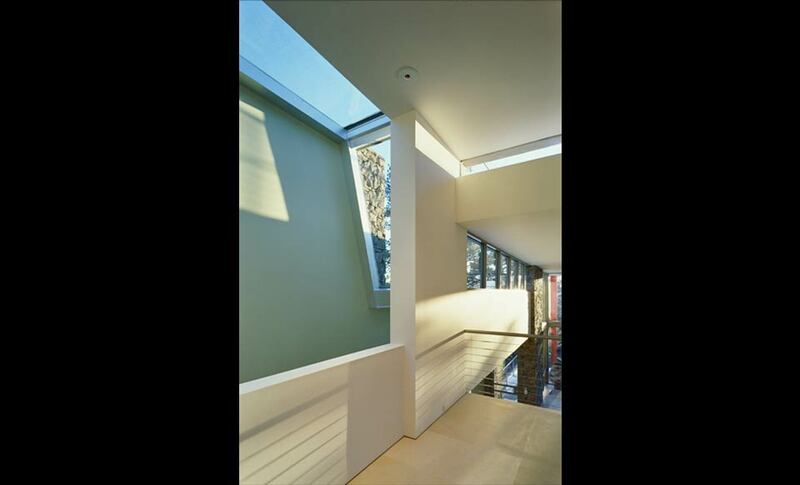 On the downhill slope, the house steps with the land allowing for the creation of a double height living room that does not project above the other alignments of the structure. 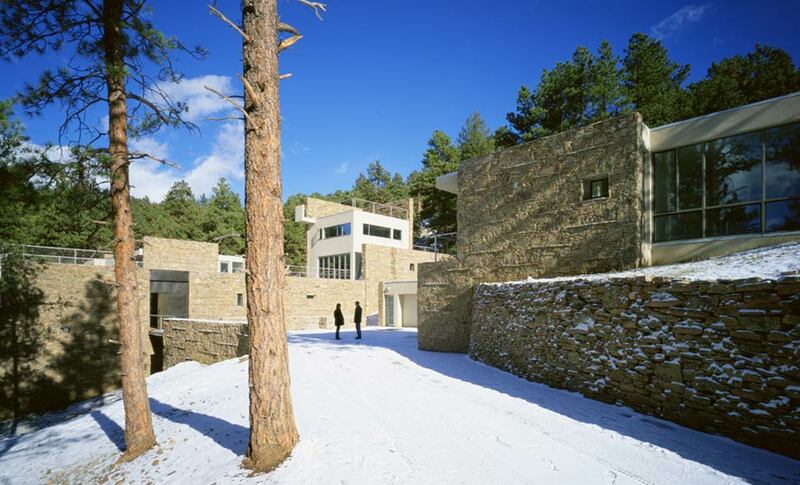 The house is a combination of architectural sophistication and a rough natural setting. 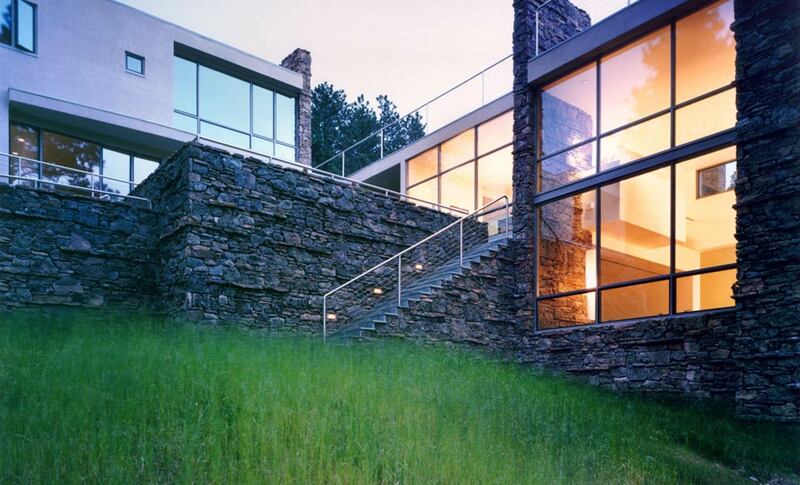 Within its walls the resident can observe nature without being submitted to any of the inconveniences of survival in the wilderness. 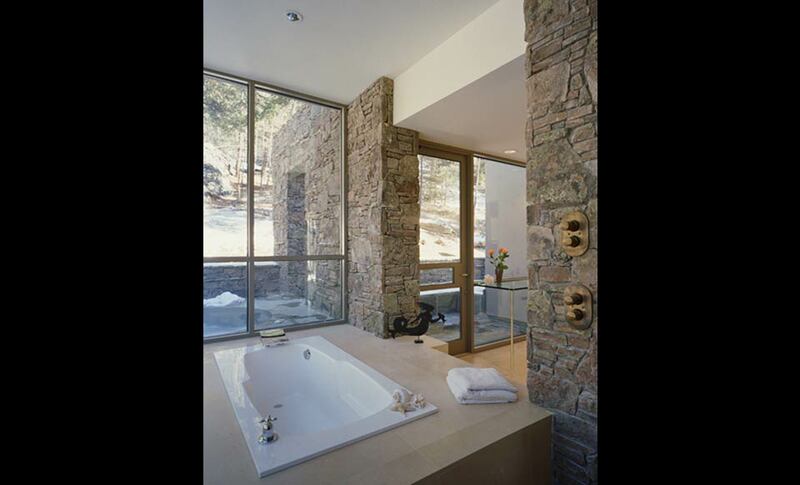 This timeless estate offers privacy and solitude with convenience to metropolitan amenities, located just 20 mins from downtown denver, denver’s international airport, minutes from the i-70 corridor in genesee park, the hot sulphur springs and close to world class skiing resorts aspen, vail, and breckenridge.